In 2000, I was the leader of Strategic Planning at the USPS when the agency was required to write a Five Year Strategic Plan. The Board of Governors was extremely interested in this requirement and I soon found that the effort to write the Strategic Plan at the height of the Internet Revolution was a controversial task that was debated at the highest levels of the organization. For me, predicting a dramatic mail volume decline seemed to be a no brainer. But there were many smart people who had seen predictions of mail volume decline before and they remembered that the earlier forecasts had all been proven to be wrong. I had a good deal of analytic support. Focusing on the coming loss of First Class Business Mail (businesses sending one another bills and making payments) alone explained a good deal of of the pending loss of volume. But the opposition view was strenuously held. There were a significant number of individuals and businesses who had a lot at stake . Private companies in the mailing industry who had to defend their businesses to Wall Street every 90 days clearly did not want to hear about the predictions of decline. Postmaster General Bill Henderson wanted me to find a more persuasive basis for anchoring the Strategic Plan. He directed me to go up to Harvard to meet with one of our advisors, Professor Anthony Oettinger, the well known Harvard Professor of Computer Science. I recognized that he had a point and we put three alternative scenarios into the Strategic Plan. The graphic to the left was presented to a conference of Mailers in 2009 by the former Chief Financial Officer and me. The Red line represents our baseline. The Green line was the worst case. We left the optimistic case off of this chart when we presented it in 2009 because it seemed to be a distraction that increasing mail volume could have ever seemed to be a reasonable forecast. The actual mail volume (Blue and Purple) showed that we had been pretty close in 2000. We were correctly forecasting the decline. (I still don’t believe that this was rocket science given what was happening in the world in 2000.) The purple line shows that following the financial crisis, mail volume collapsed. One of the problems with putting scenarios into the forecast was that everyone could find their favorite theory and it didn’t force anyone to act differently. 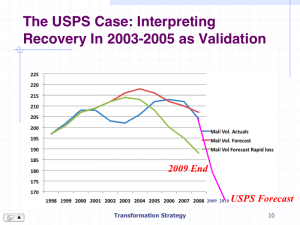 Acceptance of the baseline prediction of mail volume decline would have allowed the USPS to construct a far softer landing than it is struggling with today and to see transformation of the institution as much more of an imperative. But i don’t think that those who continued to have faith in growth were Neanderthals. What the curve that represents “actual” volume (Blue) shows is that after 9/11 there was a decline that was associated with the recession. The recovery restored volume but it left open the question of whether to interpret the growth curve as a short term reprieve or sustaining a long term growth trend. The pattern is clear today. But to have understood the strategic framework sooner would have been valuable and important to the future of the institution. 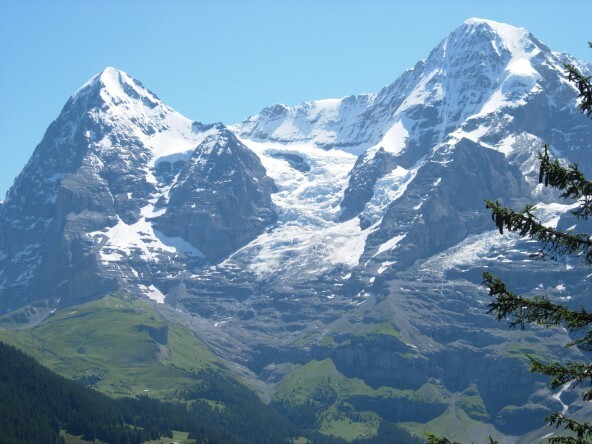 The Core Concept underlying transformation strategy began here, in Murren, Switzerland, looking at the Eiger the Monk and the Jungfrau. I had been working on better understanding what the legendary Andy Grove of Intel called Strategic Inflection Points. I had been recruited by the Postmaster General to join the USPS to define a digital strategy just as the Internet was becoming a mainstream communications medium. There had in fact been a tsunami as we had anticipated there would be. The traditional business models of the posts were eroded. I found that my digital strategy was overwhelmed by the force of culture, the leverage of the competitors and many other factors that were bigger than I was. My concept of an “access strategy” was adopted by others or perhaps they came to their own similar conclusions. Yet life happened while I was making other plans. I found that I had an exceptional vantage point on one of the great transformation challenges of our time. Instead of defining a future path that was quickly adopted by the many skeptics, they were confident to the end that change just couldn’t happen because it never had before. I was given the opportunity to call the turn (we forecast the decline in mail volume in the Strategic Plan of 2000) and to see how important it would be for the successful leaders of the future to bring the others along. I could see that future leaders would have to learn new rules. So, looking at the shape of the curves across the valley from Murren I could see the Second Curve that they had described to me at the Institute for the Future. But having lived through the experience of traveling the transformation pathway I knew how challenging an ascent it represents. The Washington Post began the week with a piece on page one top left column on the latest in popular Internet security discussion, “Search Engine Shows Risks to Machines.” (Robert O’Harrow Jr.). The piece offers an account of the discovery that a search engine that identifies devices connected to the Internet had identified thousands of industrial control systems that have virtually no security. On the one hand there would seem to be no surprise here. But it doesn’t require the imagination of Ray Bradbury to see what might happen if there were someone who sought to exploit this kind of vulnerability. There is a long period of time between the initial bombing of the World Trade Center and 9/11 that is worthy of thought when you see this kind of security loophole. But then, no one would have thought that such destructive action was possible. The front page of the Washington Post offers one of those moments that should cause us to think about the enormous changes that are underway…and their risks. What has become clear in the recent debate over financial crisis at the Postal Service is that there will be another round of debate over reform. Round 1 began 1995 when Marvin Runyon confronted the new Republican Congress that had begun to talk about privatization almost from Election Day 1994. There was also talk of new deals in which the revenue stream of the USPS would be tapped to pay for budget priorities. A need for reform was clear. But the debate lasted from 1995 through 2006 when the Postal Accountability and Enhancement Act (PAEA) was finally passed and signed into law. In 2011, as a new Republican Congress has begun to review the financial crisis that is pending for the Service, there will again be a new debate that seeks to reform the USPS. But as the debate emerges, inevitably there will be a question about Round 1. What was learned from experience with PAEA? How well did it serve the needs of the USPS? We reexamined the criteria from the 2007 paper and concluded that the emerging debate was going to miss the underlying question – what kind of a law will be needed to make the USPS a viable institution in the 21st Century? Daniel Goleman, the author of Emotional Intelligence and other related works, has written a new book Ecological Intelligence: How Knowing the Hidden Impacts of What We Buy Can Change Everything. He wrote about his ideas in a Harvard Business Review blog (“Winning in an Age of Radical Transparency” May 27) on the dynamics of the competitive marketplace in coming years. Given the new transparency that is made possible by technology Goleman argues, everything will change. The theory, Goleman notes, is that the more transparent a market the healthier it will be. Giving customers the benefits of social welfare, holding back prices, enforcing consumer protections with competitive services and growing a more concerned and aware consumer constituency for the products that they purchase – all of these are the benefits of the open market and information symmetry. In seeking to remedy the ills that lead to the financial crisis, there has been a great deal of discussions of using transparency to facilitate the self-regulation that was missing leading to the market crash. When President Obama took office, he asserted that his administration would use transparency to improve the ethics of government and the performance of programs. Government-wide there is more access to the inner workings of federal program expenditures and acquisition in ways that has never been possible in the past. In his new book, Goleman explores the implication for consumer markets of the parallel between transparency in financial regulation and revealing the ecological impacts of consumer goods. “There are signs of a trend toward greater marketplace openness about the environmental and health consequences of products.” He notes that the launch this year of Goodguide.com is a significant departure in giving consumers inside information. Goleman envisions a world of radical transparency in which Life Cycle Assessments are not only available to consumers but are required of future companies. As secrecy is rendered ineffective by such trends as the obligation to publish the contents of the product, the competitive advantage that could have been gained from surprise will be lost. Competitors will find it far easier to benchmark the high performing enterprise in their markets. They can accelerate their movement to the high performance frontier and take away any performance related competitive advantages that their competitors might have enjoyed. “I believe that APWU members should join with other groups and unions that are confronting corporate power. There is a need for education and communication to understand our class interest, not only to enlighten and motivate current members, but to also broaden our base by bringing in new activists. The Postal Service is suffering from a financial hardship created in part by modern technology. With the use of faxes, e-mail, the Internet, and teleconferencing, there has been a decrease in mail volume. But the Postal Service is also suffering from the failed economy and failed business models. The result has been the excessing of postal employees at installations all over the country, with jobs continuously being lost or at risk of being eliminated. If the “no-layoff clause” ceases to exist in our next collective bargaining agreement, postal workers would be just as susceptible to losing their jobs in the future as other workers are today. The time to become alarmed about our welfare as workers is not after a catastrophic event, but before it happens. Our concern, however, should be not just for our jobs and our potential loss of benefits, but for all working-class people in this country who are being denied the opportunity for a decent life. The problems that we continue to face are numerous. Millions of Americans lack health insurance and have inadequate coverage for prescription medication; the child poverty rate is on the rise; there are serious deficiencies in our education system; and we have major environmental challenges. America’s poor and its workers are losing the class war. The poor, minorities, immigrants, members of unions, progressives, and environmentalists must join in a national effort to challenge the corporate order and empower themselves so that they can control their own economic and political destinies. Working-class men and women must unite. There has to be an unrelenting focus on breaking the iron grip that big corporations have on our country and our lives.